If you have a patio in your outdoor space or are building one, landscape lighting is important to its aesthetic and to ensuring safety on dark Virginia nights. That’s where O’Grady’s Landscape comes in! 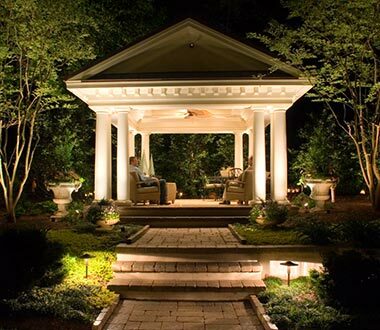 We offer patio lighting of the highest quality for our clients throughout Northern Virginia and can customize your design to your landscape and stylistic preferences. We can help you create a brand new patio complete with the best lighting—or just get your hardscapes winter-ready with patio lighting for year-round use. Request your consultation today to get started! Want to save even more on your monthly energy bills? Invest in a patio lighting system with an automatic timer so that it will automatically turn on and off when you want it to. Additionally, low voltage systems and LED lights use a lot less energy than incandescent bulbs, and they are extremely stylish, adding to the aesthetic appeal of your patio design. We typically use CAST lighting systems for all of our patio lighting designs—known for their extreme durability, reliability, and beauty. We can also offer you walkway lighting if you have a pathway leading to and from your patio, further increasing safety and security on dark nights. O’Grady’s Landscape has been providing comprehensive patio design and installation services to Northern Virginia homeowners since 1991—and that includes the patio lighting. With energy-efficient light fixtures to choose from and the expertise of dedicated landscapers to help you make the best decisions, you know your project is in trusted hands when you choose us for the job. So let’s complete the look and feel of your landscape together! Contact us online or by phone at (703) 533-5001 to bring your patio to life with Northern Virginia’s patio lighting experts.